Flower of Tartan Ribbon is available to buy in 7mm (1/4"), 10mm (3/8"), 16mm (5/8"), 25mm (1"), 38-40mm (1½") and 70mm (2¾") widths on 25 metre (approx 27½ yard) reels. The Flower of Scotland Tartan Ribbon sold by tartan-ribbon.com is top quality, authentic Scottish tartan ribbon as certified by the Scottish Tartans Authority. Back in stock after an absence of a few months and now being offered on larger 25m reels and in new widths! 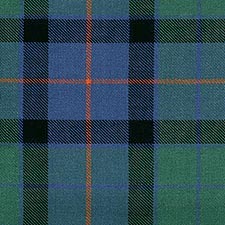 The Flower of Scotland Tartan is a modern tartan, especially popular for use at weddings and similar to a range of ancient other tartans such as the Ancient Gunn and Ancient Hunting Stewart. "Ancient" and "Hunting" variants tend to be lighter and more subdued in colour than the original clan tartan, so the softer shades of the Flower of Scotland tartan ribbon make it an excellent alternative to many otherwise unavailable tartan ribbons.